Discussion in 'UFC Discussion' started by TheUpsetter, May 31, 2014. 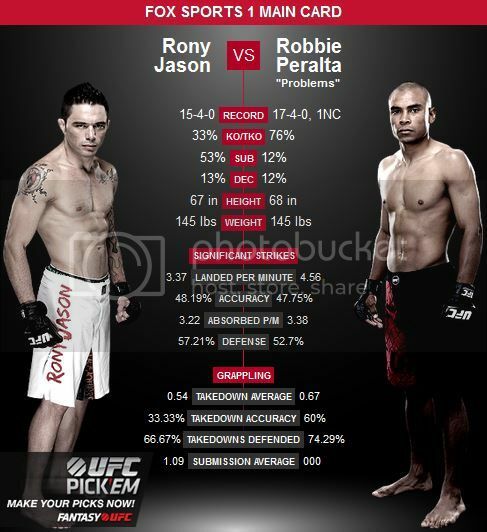 Think Rony Jason takes this, but i am rooting for Robbie. Nice to see the arena pretty empty. Don't know much about these two guys. Any background? Who's the favourite? I have both overestimated, and underrated Jason in the past. Two guys with massive power. Peralta's got a couple big wins over Takaya and Jason Young. Peralta's the more well rounded guy imo but Jason's got some explosiveness and extra scrapiness to him. Jason is a TUF Brazil winner.